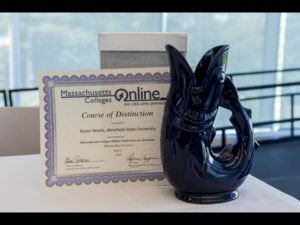 The tremendous creative work and talent that go into offering an eLearning course will be honored at the annual Massachusetts Colleges Online Conference on eLearning: Sharing Best Practices. While it is recognized that every eLearning course includes innovative teaching and creative uses of instructional technology, each MCO institution may nominate two courses: one that demonstrates outstanding faculty innovation and course practices in an online format and one that demonstrates outstanding faculty innovation in a blended format. The nominated courses will be recognized with a MCO Course of Distinction (COD) award named after the Bay State’s unique association with the Sacred Cod. Encourage faculty to incorporate successful strategies/techniques into their online/blended courses. Showcase the courses and faculty in presentations at the Annual Conference and allow the attendees to view the courses from a student’s perspective. Serve as an excellent public relations opportunity for the nominating institutions, the faculty members, and MCO to publicize the success of online and blended learning and course quality.